Concrete floors that have been waxed and buffed look absolutely gorgeous. However, the tedious work involved just to achieve that aesthetic is not something any homeowner is willing to go through on a regular basis. If you want the same shine and smoothness, there is an alternative that you won’t have to slave for. Polished concrete is one of the most popular methods of enhancing and refinishing a concrete floor. It involves a series of grinding that aims to remove the top surface and reveal the damage-free layer underneath. The abrasive pads are used from the coarsest to the finest until the right shine and smoothness are achieved. Property owners love this because it is simple yet stunning and very easy to clean and maintain. Step 1: The process begins with the coarsest abrasives in the grinding machine. This will grind out the top layer, which is often damaged or worn-out. Step 2: The abrasive pad is replaced with a slightly finer version to smoothen out the surface. This will go on, each session using finer grits until the desired shine is achieved. Step 3: In a dry grinding job, one worker operates the grinding machine while one vacuums the dust created. In a wet concrete polishing job, the sludge, which is a mix of water and dust, is collected and then disposed of following the proper disposal method. Step 4: When it is smooth and shiny enough, the concrete floor is cleaned, washed, and air-dried. A concrete sealer is then applied on it to make sure it is protected against damage. It is also a way of sealing the pores of the concrete slab, preventing it from absorbing dust and moisture. Say goodbye to tedious waxing and buffing. 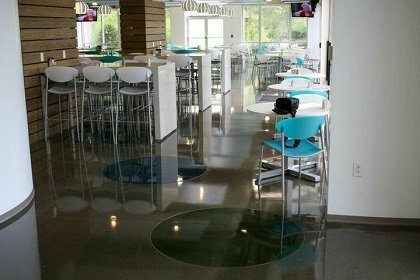 Call (720) 545-1766 for low maintenance polished concrete floors. If you love the look of concrete but want it to be more presentable and elegant, Denver Concrete Artisans can help you with that. We transform existing concrete slabs into stunning polished surfaces. We have been in the business for over 20 years and we know how difficult it is to maintain the shine of a concrete floor. With concrete polishing, we can enhance your floors to a more polished look, without any waxing or buffing required on your end. Interested? Call us today and let us inspect your concrete floor for free to check if it is qualified for concrete polishing. We’ll also offer a quote, free of charge!